By Garett Sloane . Published on November 10, 2016. Snapchat is using this 'Snapbot' to sell its augmented reality glasses. Snapchat is tapping into its usually playful, surprising marketing playbook for its first hardware product: Spectacles. The company, known by the corporate name Snap, planted a vending "bot" near its headquarters in Venice Beach, Calif, to sell the sunglasses called Spectacles. Last month, Snapchat revealed its secret hardware project, building the digital specs, which capture people's experiences and transmit the videos to its app. The glasses sell for $130. 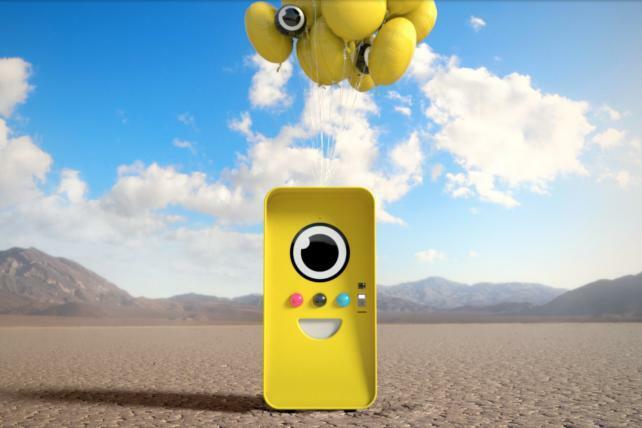 On Thursday, Snapchat revealed that it would sell the glasses through "Snapbots," which have some "personality," according a statement from the company. People step into the bot's field of view and use the screen to virtually try on the glasses in different colors before choosing. The screen uses the same technology that Snapchat's app uses to bring animated lenses to selfies. Lenses are a form of augmented reality that decorate videos. It remains to be seen how popular Spectacles will become. Snapchat has promoted them as more of a fun vanity project than a world-changing technology. That's helped manage some of the hype, in contrast to the wildly over-hyped, and ultimately failed, Google Glass. Google's glasses project became a public relations nightmare over privacy concerns. The $1,500 price tag didn't help. Snapchat has relied on mysterious marketing strategies for most of its promotions. It's known for erecting prominent billboards featuring just its ghost logo. With Spectacles it dropped a vending bot without any prior announcement. Snapchat appears to take great care to leave its mark, but not aggressively, to maintain a sense of cool around its advertising. Snapchat isn't saying where the vending bot will show up next.